1Department of Pharmacognosy, Technocrats Institute of Technology-Pharmacy, Bhopal, Madhya Pradesh, 462021, INDIA. 2Pharmacognosy and Phytochemistry Laboratory, Faculty of Pharmacy, VNS Group of Institutions, Neelbud, Bhopal, Madhya Pradesh, 462044, INDIA. Background: Ventilago calyculata Tul. (‘kevati’), is found throughout India as climbing shrub. It is widely used in various traditional system of medicine. 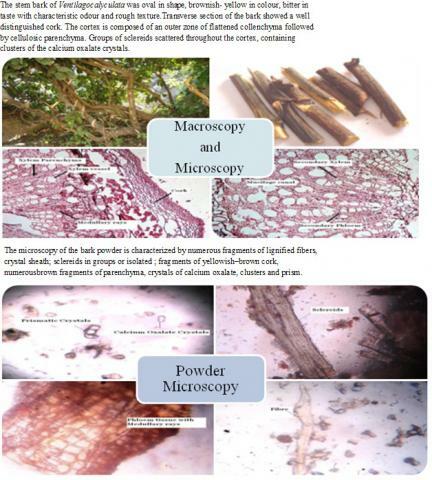 Objective: In the present work pharmacognostical standardization has been developed for the systematic identification of the bark of Ventilago calyculata. Phenols and flavonoids were also quantified. Materials and Methods: Morphological, microscopical and phytochemical studies were performed. Various physicochemical parameters conforming the identity, quality, purity of the bark. The quantity of phenols and flavonoids were estimated. Results: The bark was oval, brownish yellow, bitter with characteristic odour and rough texture. The microscopical studies revealed the presence of cork with brownish contents, crimson inner cork, collenchyma, cellulosic parenchyma with cuboidal calcium oxalate crystals and schlereids. The total ash value, acid insoluble ash value and water soluble ash values of stem bark were found to be 15% w/w, 3.4% w/w and 11.6% w/w respectively. The percentage yields, total phenolic content and the total flavonoid content of the petroleum ether, chloroform, ethyl acetate, ethanol and aqueous extracts were 2.77% w/w, 2.66% w/w, 3.8% w/w, 5.8% w/w, 11.0% w/w; 2.16 ± 0.04, 4.16 ± 1.04, 9.12 ± 1.14, 7.16±1.16, 1.16 ±1.02 mg/g (gallic acid equivalent) and 4.5 ± 0.55, 8.20 ± 1.12, 10.1 ± 0. 26, 6.5 ± 1.3, 0.66 ± 1.13 mg/g (rutin equivalent) respectively. Conclusion: There was a need to evaluate the extracts of the plant in order to provide scientific proof for its application and to explore the possibility of treating various diseases and disorders. Literature review indicates that very less work has been done on this plant and there is a wide scope for investigation. Keywords:standardization, total flavonoid content, total phenolic content, Ventilago denticulata Willd, Ventilago madraspatana var. calyculata (Tul.) King. Kumar S, Natarajan B, Kanakamma LP, Ashish TF, Pawar RS. Pharmacognostical and Phytochemical evaluation of Ventilago calyculata Tul. (Bark). Pharmacognosy Journal. 2015;7(5):271-275. Ventilago madraspatana var. calyculata (Tul.) King. Total Phenolic Content and Tyrosinase Inhibitory Potential of Extracts from Cajanus cajan (L.) Millsp.